"Scooped-out zucchini 'boats' are grilled with a creamy tomato-basil sauce and shredded cheese, and topped with parsley for a great summer barbecue side dish." Use small spoon to scoop out insides of zucchini halves, leaving 1/2-inch-thick shells; discard removed pulp or reserve for another use. Place zucchini shells, cut-sides up, on foil-covered baking sheet sprayed with cooking spray. 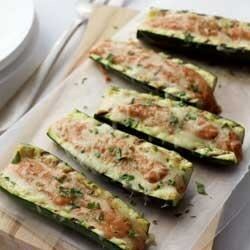 Spoon Cooking Creme into zucchini shells; place baking sheet on barbecue grate. Grill 10 to 12 min. or until zucchini is tender; top with shredded cheese. Grill 3 to 5 min. or until cheese is melted. Substitute: Substitute fresh basil for the parsley.